Mike Skinner and his wife, Angie, helped raise over $125,000 for a local Florida charity with the seventh annual Cessna Skinner Round-Up. 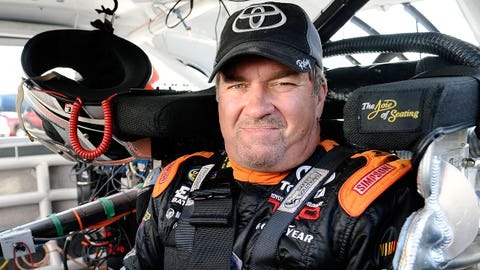 Former NASCAR Camping World Truck Series champion Mike Skinner rounded up a few of his friends for a game of golf and raised a host of money for a good cause in the process. The seventh annual Cessna Skinner Round-Up was a two-day event that featured a golf tournament at Spruce Creek Country Club and the Hoedown Bash at Daytona International Speedway, which raised $125,000 to help support the Council on Aging of Volusia County (Florida). While the donations are still rolling in, the former champ plans on writing a big check to help out those in need. "It’s always such an honor to host the Cessna Skinner Round-Up here in Volusia County," said Skinner. "We have such great partners for this event, such as Cessna, Hard Rock Seminole, Halifax Health, Oral-B, SunTrust Bank, Toyota, National Wild Turkey Federation, Germain Motor Company, Froggy’s Saloon, Richard Childress Racing, Yuengling, American Auto, Maui Jim, Justin Boots, and so many others. "It’s such an honor to have their support, and the support of all of our guests and attendees-including many people who don’t even have a direct connection to Volusia County," he said. "However, they’ve gotten behind Angie and me, and they’ve stepped up to support the Council on Aging, and that’s something that’s really special to be a part of." Over the seven-year history of the event, the Skinner Round-Up has raised over $900,000 for various charitable organizations in Volusia County. The Council on Aging of Volusia County has been a part of the effort from the beginning. "The Council on Aging has always been one of our charitable partners at the Cessna Skinner Round-Up," said Angie Skinner, co-host of the Cessna Skinner Round-Up. "After moving back to Daytona Beach and taking a position on the Council on Aging of Volusia County’s staff, Mike and I knew we wanted to bring the Skinner Round-Up back in 2015. It’s no secret that this event takes a lot of work, but to be able to watch everything come together and see the difference that it makes in our community makes it very rewarding. Between our fantastic sponsors and the generous support of our attendees, we were able to host another successful event this year and look forward to seeing everyone back at the Cessna Skinner Round-Up in 2016." Along with the Skinners, the event featured former Truck Series greats Todd Bodine, Rick Crawford, Ron Hornaday and Jack Sprague, as well as former NASCAR drivers Steve Park and Greg Sacks. Other attendees included former NFL players Ken Huff and Chris Mohr, retired NBA player Jack Marin.